But the main ones are Breakfast, Lunch, and Dinner. We don't have many other specific names for meal times in the day. Wondering if it's like this in all cultures currently, and if not, how variable it is (I know nothing about this). And then wondering where it got started if it's not universal. The paleo diet has a lot of experimentation with meal times. Some even suggest a 8-12 meals a day. But it's too early to have names for those. Then they speculate about hunter-gatherer societies potentially eating at most 1-time in a day, maybe not for several days in a row. So wonder what kind of concepts they had for meals. As for mealtimes, few people in northern Europe ate breakfast in 1501. The medieval two-meal rhythm of the day persisted: dinner was at about 11 a.m. and supper at about 5 p.m. But as more people moved into towns, and made their living by working long hours for other townsmen, the time at which they could have supper was pushed back into the evening. This meant that dinner, the main meal of the day, had to be eaten a couple of hours later and became lunch. It followed that you had to eat an early meal, breakfast, in order to get through to lunchtime. School also helped bring about this change, for more and more boys went to school, and the long lessons required that they eat breakfast. Hence breakfast was ubiquitous in towns by 1600. By 1600 most people followed a routine that you will probably recognise. They washed their face and hands and cleaned their teeth when they got up in the morning. They had breakfast and went to school or work for about eight o’clock. They ate lunch around midday, and came home and ate supper with metal knives and spoons off plates, warming themselves at a fireplace. *The book was also printed under the title "Human Race: 10 Centuries of Change on Earth"
Well, it certainly isn't like that in all cultures. Similar to breakfast. 7-8 am. Mainly coffee and/or some dairy product. Maybe some fruit, juice or cereals (specially kids and people who are not in a hurry to get to work). Second breakfast, similar to English lunch. 10-11 am. Sandwich or toast, maybe fruit or juice, and probably coffee or a cold beverage. Usually depends on what you "missed" during breakfast. Similar to dinner, but earlier: 1-3 pm. Similar to afternoon tea, but later: 5-6 pm. Kids get a sandwich, fruit, or some sweet snack. Adults usually have just a coffee and maybe some pastries. Evening dinner, i.e. supper. 8-10 pm. Like the comida but lighter (unless you're dining out). Now, it is true that some people skips desayuno and just have a heavier almuerzo, verging on a brunch; and merienda is barely a thing anymore for many adults, because work :( But, in a general sense, most people follow this meal plan. 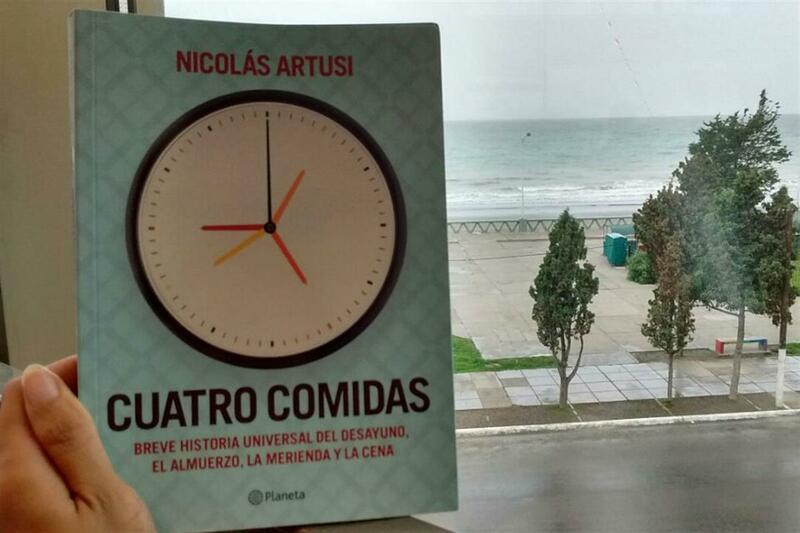 - Los horarios y las comidas en España ("Schedules and meals in Spain") [PDF]. Spain's Ministry of Education, Culture and Sports; 2010. Another one, with interesting comments: A qué hora y cuántas veces se come en España. It is not like that in all countries. I don't know when this came about, but you can find out by opening a question on portuguese.se asking for the origin and earliest uses of "lanche" with its current meaning of "afternoon snack". "The Romans believed it was healthier to eat only one meal a day," she says. "They were obsessed with digestion and eating more than one meal was considered a form of gluttony. This thinking impacted on the way people ate for a very long time." In the Middle Ages monastic life largely shaped when people ate, says food historian Ivan Day. Nothing could be eaten before morning Mass and meat could only be eaten for half the days of the year. It's thought the word breakfast entered the English language during this time and literally meant "break the night's fast". Most countries I know have 4 meals: Breakfast, Lunch, a small afternoon meal or Snack and Supper. Please note that most of these countries have influence of Spain, Portugal and in my particular country, Italy. So you could say most of Latin countries (both from Americas as European) have 4 meals, not 3. Going out of the Latin influence, I noticed the same four meals in London and Paris. Bottom line is the 3 meals are far from being universal, and it seems to be just a localized subject, as proven by most answers provided here. Well, according to this peer-reviewed academic research eating three meals a day is a product of the Industrial Revolution. Until about 1800 people in England ate 2 meals a day. And lunch is the latest addition, but a 1755 dictionary described it as an amount of food you can hold in your hand, rather than a meal at a specific time. Not the answer you're looking for? Browse other questions tagged cultural-history food or ask your own question. What is the origin of Jataka tales? What's the origin of Crespi plates? What was special about ground foods for sacrificial meals?